In my head, the end of the summer is synonymous with melon season at the market. 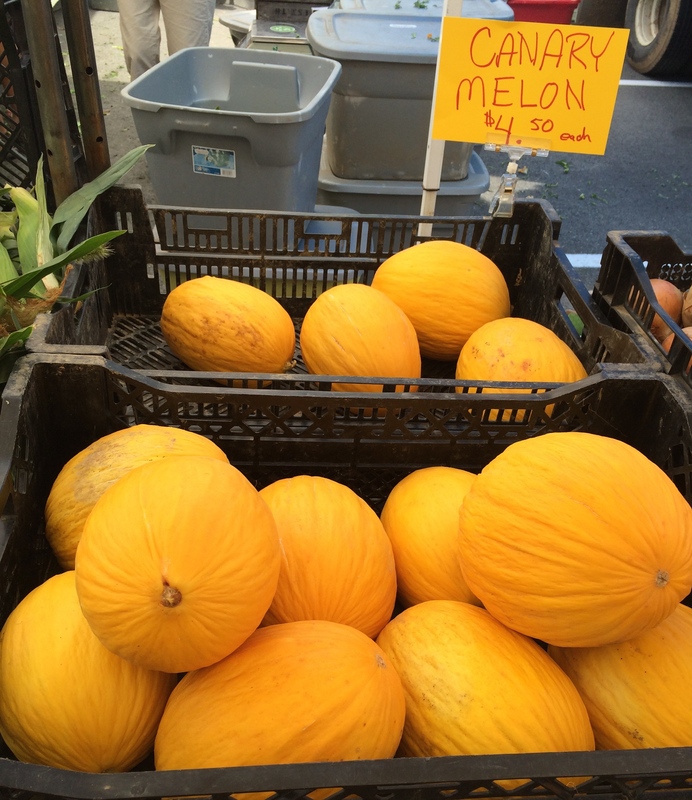 Cantaloupes, honeydew, and even the less-well-known canary melon can all be found at Central Farm Markets. Of course you can also find the most popular and iconic melon of the season, Watermelon. 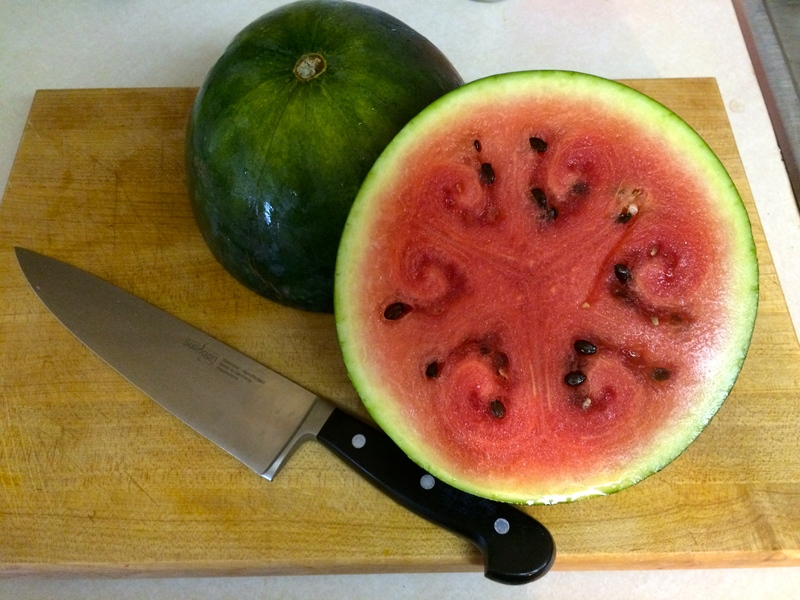 Watermelons remind us all of hot August days, swimming pools and BBQs. That’s why I decided to elevate this sweet, summer fruit and turn it into a savory salad, perfect for those hot summer nights under the stars. The watermelons that I grew up with didn’t have seeds. We got them at a grocery store, they were huge, and all you had to do was cut them up and eat the fruit. Farm market watermelons are different. They generally have seeds (although some vendors sell seedless) and are a bit smaller than generic watermelons. I know what you’re probably thinking – why would I want a watermelon with seeds when I can just as easily get one without and not have to go through the arduous process of removing them? Well, truly find that watermelons with seeds taste better. 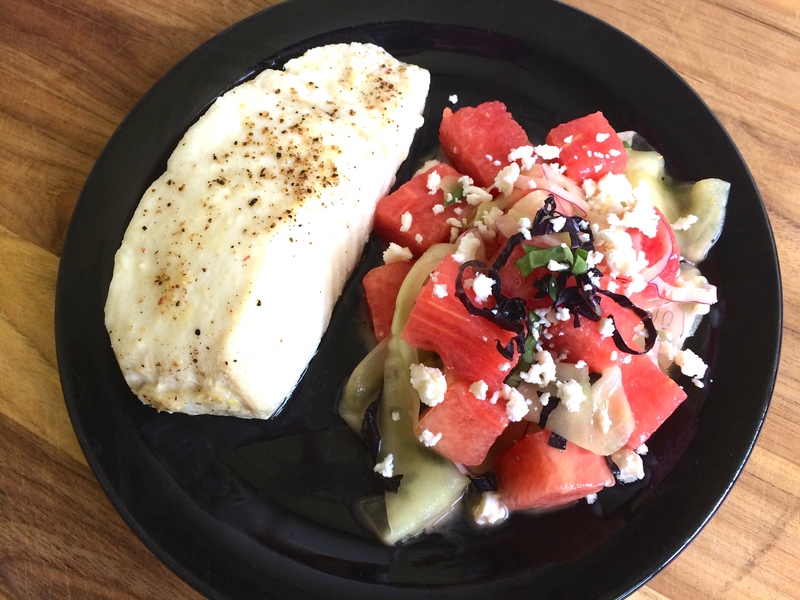 They have a sweet, rich flavor that I find seedless watermelons lack, which is why I used a watermelon with seeds for this recipe. The extra five minutes of effort it takes to remove the majority of the seeds is completely worth the delicious end product. Some other important ingredients to note in this recipe: the red onion is essential here. I’ve heard quite a few people tell me that they don’t appreciate raw red onion as much as I do. I understand – it’s definitely got a spicy, bitter taste but there is a trick to combat that. Slice your onion and rinse it under cold water. Squeeze out the water and voila, not so spicy! I always tell people that the fresher onions are, the easier it is to get that delicious taste from them. Also, know when to use red onions! They work perfectly with this salad to balance all of the sweetness from the watermelon. 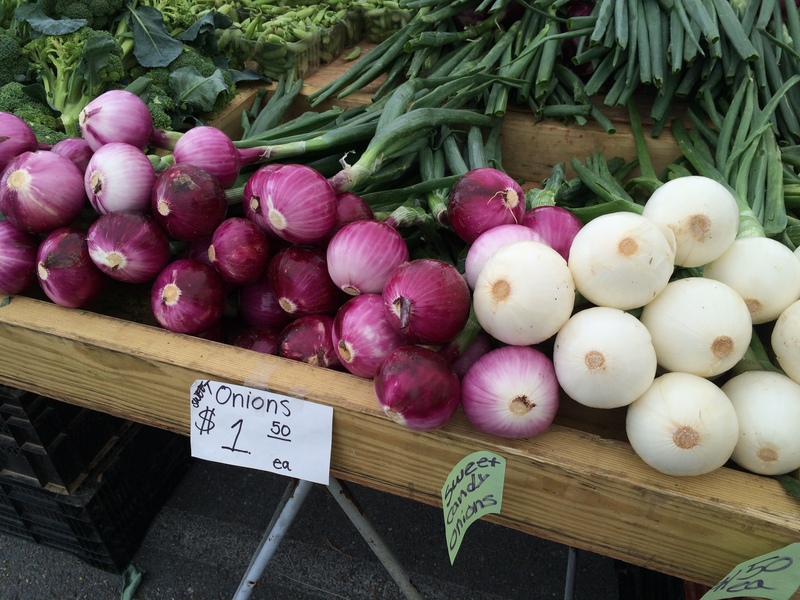 I considered using one of the delicious-looking sweet white onions I saw at the Westmoreland Produce stand, but I needed something that would counteract the already bold flavor of the watermelon. Thus, red onion was added to this recipe. This recipe is for an entire watermelon. It serves about 4-6, depending on the serving size. Set oven to broil. Rub olive oil, salt, and pepper on all sides of the fish. Place on a sheet pan and broil in the oven until fish is done. 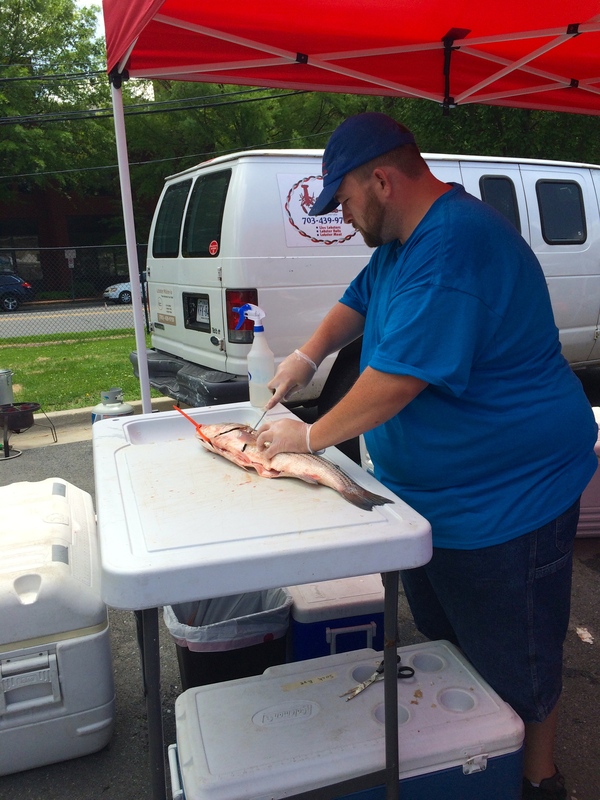 This will depend on the size and thickness of the fish. Generally, about 5-7 minutes. Meanwhile, make the salad. Cut the watermelon into cubes. Remove the seeds as much as possible. There may be some left over pieces with many seeds. I like to press these pieces and make watermelon juice (I don’t let anything go to waste in my kitchen, if I can help it). Using a vegetable peeler, peel the green part of the cucumbers. Starting on one side and turning the cucumber with each peel, make ribbons. Do this until you reach the seeded part. (You can juice this part, too, or just eat it as a snack). Peel the red onion and cut it in half. Using a mandolin, or a very sharp knife, slice the onion very thin. Stack the basil leaves on top of one another, roll into a log, and finely slice. 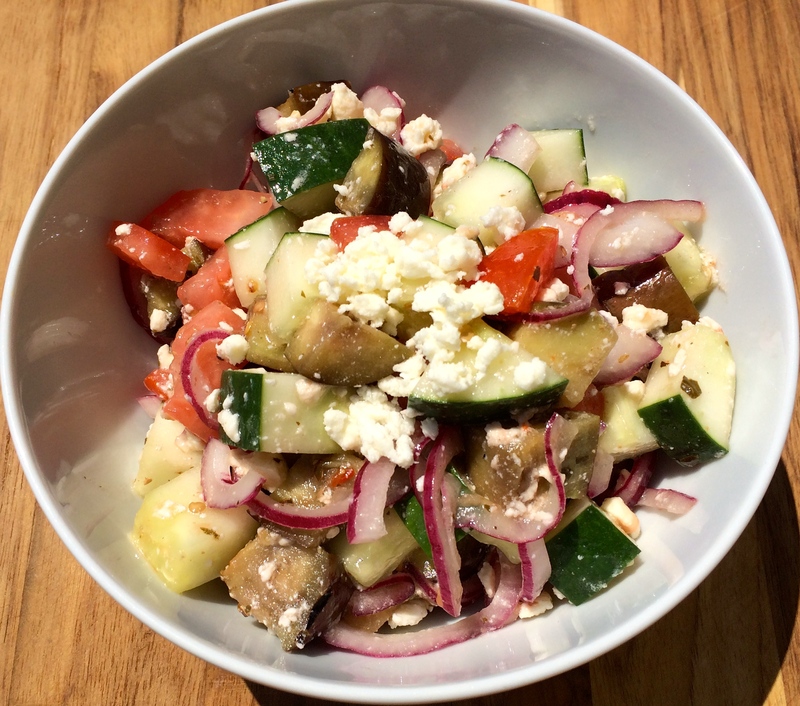 Combine the watermelon, cucumber ribbons, red onion, and basil in a large bowl. Crumble about 3⁄4 of the feta over the salad. Alternatively, use as much or as little as you desire. Add the vinaigrette. Toss to combine. Plate the salad next to the Halibut. Enjoy!!! I’m a big fan of ratatouille. No, I’m not talking about the movie, although I do enjoy watching that cute little rat cook! I’m referring to the traditional French stew made from delicious summer vegetables such as zucchini, tomatoes, and eggplant. Other items are thrown in there as well – typical additions include sweet bell peppers, garlic, and onion. Then there are the offshoots of traditional ratatouille that exist in different cultures, such as the addition of capers and celery in Sicily, or the accompaniment of a fried egg in Spain. Ratatouille and its components have endless possibilities – the only thing I believe is essential is the freshness of the ingredients. If you’re working with fresh, seasonal produce, you really can do no wrong. 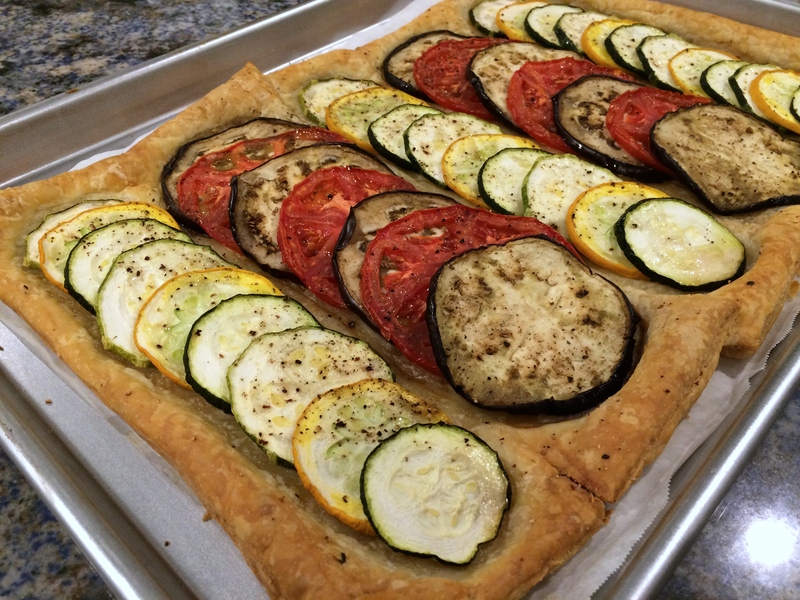 That’s why this time of year is best for creating a Ratatouille tart. The effortlessness of this dish and the ease with which it is crafted makes this tart a perfect addition to your dinner table. The ingredients are simple: a tomato, an eggplant, a zucchini and two types of squash. Go out and purchase a box of frozen puff pastry and then all you need now is salt, pepper, and olive oil. If you’d like to elevate the dish, sprinkle some feta cheese on top after the tart has cooled. I considered it, but I truly enjoyed the rich flavors of the vegetables so much that I chose not to add anything else. I chose to go with the simplest of preparations, both to showcase the bold flavors of the vegetables and to include this recipe as another of our CFM Savers. This tart can be made by spending just a few dollars at the farm market, yet I guarantee it will look and taste as delicious and amazing as if you’d bought it from a gourmet grocery store. 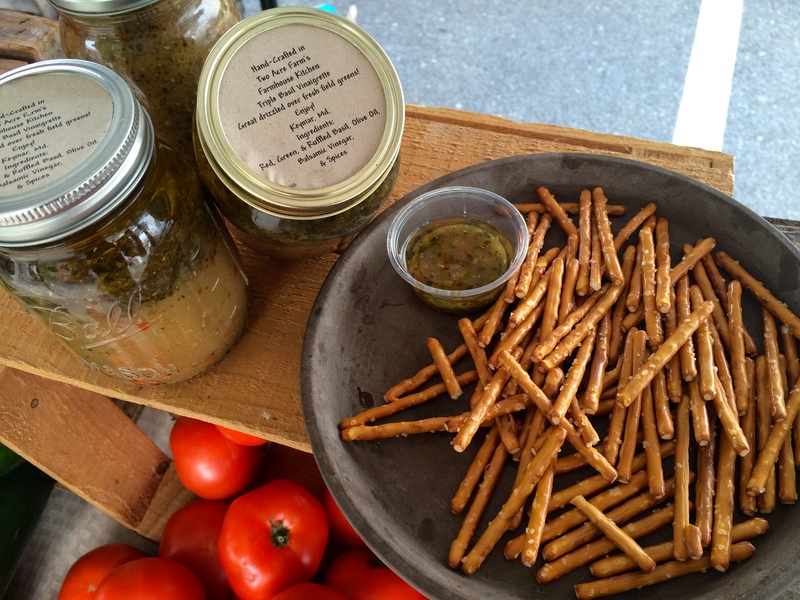 Before I share the recipe with you, I would like to take a moment to talk about the striped zucchini, which I found at the table of goodies at Young Harvests. 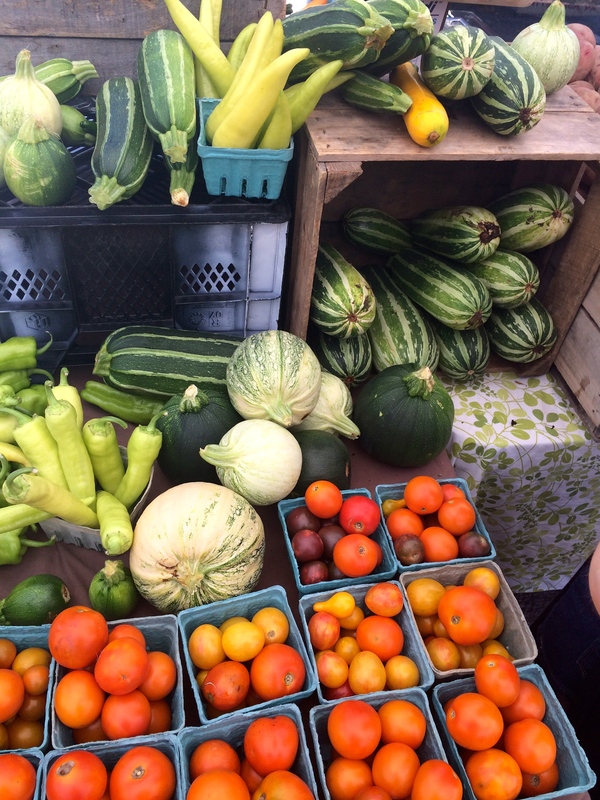 This is the time of year when Rob, the wonderful owner and farmer of Young Harvests, brings us an amazing bounty of produce, varying from his standard mixture of greens and herbs, to red skin potatoes, to all different types of squash, peppers, and tomatoes. It’s so much fun to watch the items come and go, to have the sense of “get ‘em while he’s got ‘em!” I love walking up to his table to see what fresh produce he’s brought to us this week. That is how I found myself staring at the beautiful striped squash, wondering if I could somehow incorporate it into my life. I later found out this was called a “Costata Romanesco” squash. As this recipe only calls for half of one, I sliced the other half, tossed it with some olive oil, salt, and pepper, and threw it into a pan for a few minutes. I’m telling you, this is no ordinary squash. It’s a must try for anyone who likes to challenge traditional flavor profiles. 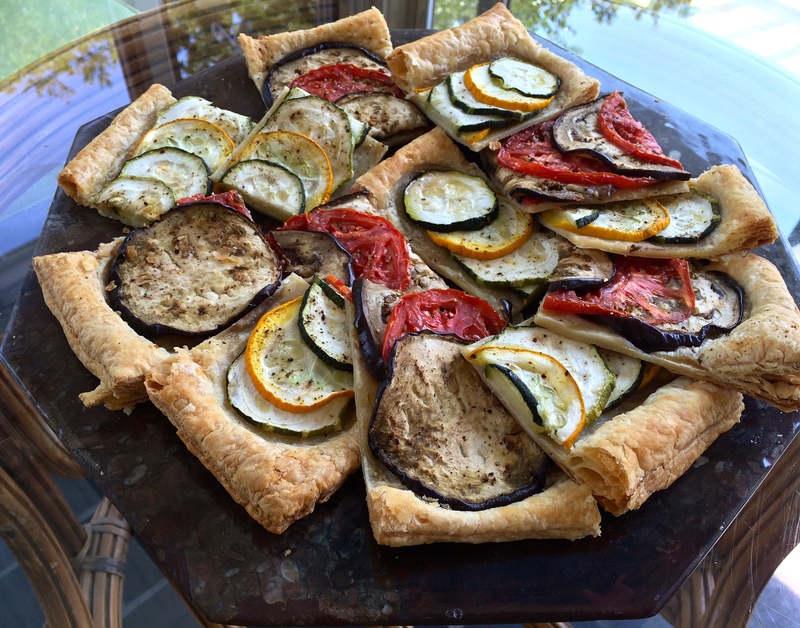 *Try to obtain zucchinis, squash, eggplant, and tomatoes with similar diameters for a more even look to your tart. Make sure to leave the frozen puff pastry out to thaw at least 3 hours before you begin this recipe. Preheat your oven to 375°. Remove sheet of puff pastry from the box and lay on a surface sprinkled with flour. Using a rolling pin, roll pastry to the size and shape of a standard half-sheet pan (about 12×18 inches). You will need to trim some of the dough to make it fit – I ended up trimming about 1/3 off one of the sheets. Place parchment paper on the sheet pan and lay the dough flat. Make sure to layer the two sheets about ¼ of an inch and press them together, so they stay together during the cooking process. Use a fork to poke holes in the dough. This will allow air to escape and prevent bubbles or uneven baking. 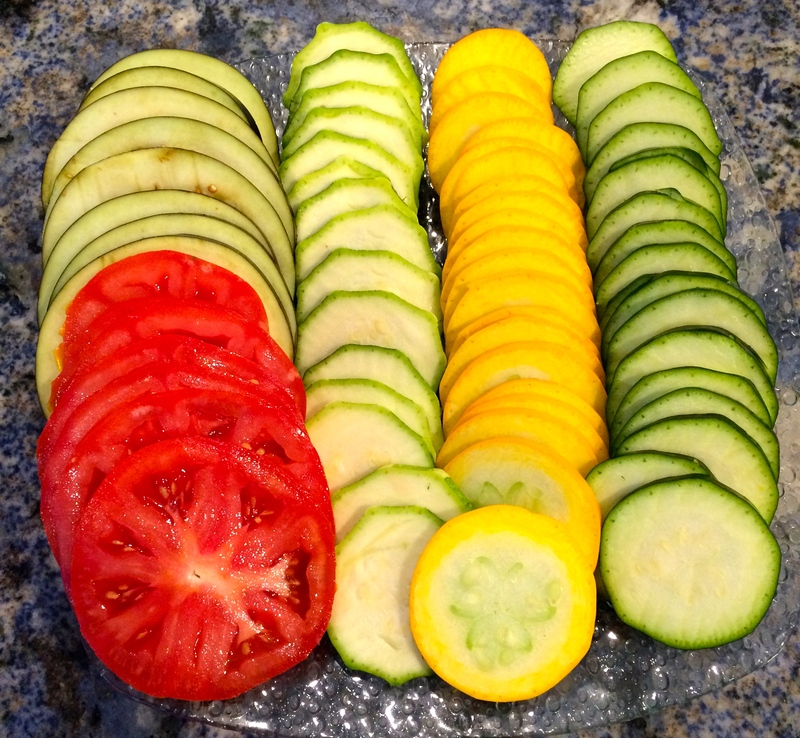 Using a mandolin, cut the zucchinis, squash, eggplant, and tomato into even rounds. If you do not have a mandolin, use a knife! Drizzle 3 Tbsp. of Olive oil on the pastry dough and use a brush to spread it evenly. Lay out your veggies in whatever pattern or order you wish. I chose columns of zucchinis and squash alternating between columns of eggplant and tomato, but use your judgment! Drizzle the remaining 2 Tbsp. Olive Oil on top of the veggies and really go crazy with the salt and pepper. I found that the pepper brings out some amazing flavors in the veggies. Place in the middle rack of the oven and bake for 1 hour, rotating the tart half way through. Remove from oven and let cool. Slice and enjoy! I would like to introduce you to an exciting product, one you may or may not have come across in your farm market travels: the Kiwi Berry. Not quite a kiwi and certainly not your traditional berry, the Kiwi Berry is a unique, smooth-skinned fruit (a cousin of the well-known kiwi) that originated in the temperate, coastal regions of Russia and China. Though they make look different on the outside, the inside of the berry bares a striking resemblance to their New Zealand-native cousin. Some even say they taste similar, too. I drove out to Kathy Glahn’s Kiwi Berry Farm in Gettysburg, PA earlier this week to learn more about this not-so-common, but certainly delicious fruit. Driving up the driveway, I found myself surrounded by rows of beautiful green vines to my right and left, encompassing an adorable little home in which Kathy and her husband, Jeff, reside. I knocked on the door and was greeted by a beautiful dog, an inquisitive cat, and Jeff. I was soon taken to the back where Kathy stood among the vines, clearly in her place of happiness and peace. Kathy certainly knows a lot about agriculture and farming. She grew up on a dairy farm in Wisconsin where she later met Jeff. After several moves, they ended up in their current residence in Pennsylvania. Kathy began growing micro greens and other produce for local gourmet restaurants. 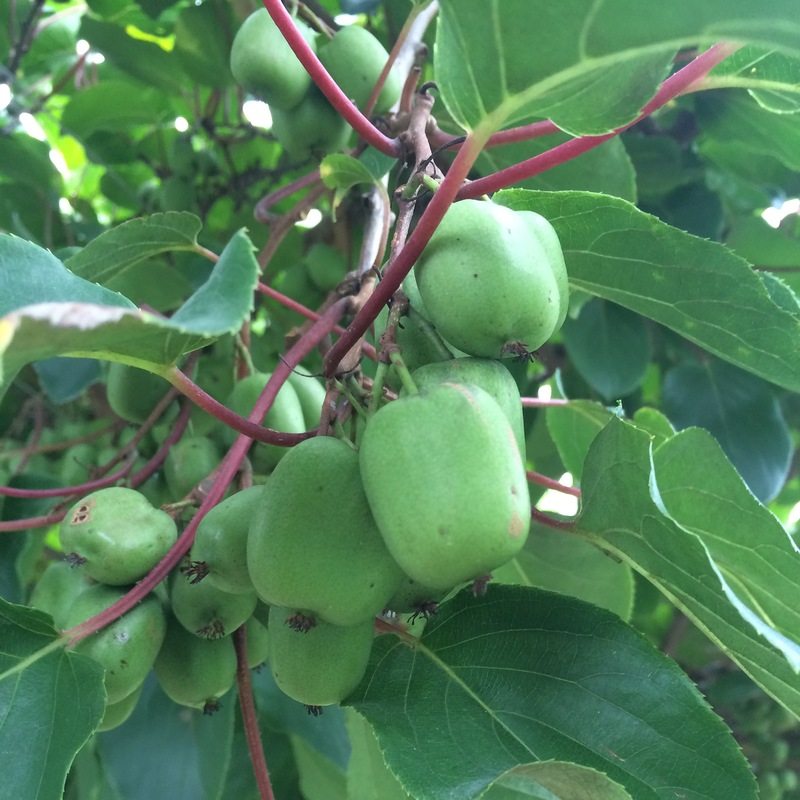 As soon as she discovered kiwi berries, Kathy decided to devote all of her time to raising these hardy little fruits. She first found them in a nursery in New York where she met a grower and soon began the long process of growing and cultivating them. Kiwi berry vines take a long time and a lot of effort to bear fruit. There is no fruit on a male vine, only flowers. Pollination, which takes place near the end of May, happens by strategically intermingling male and female vines and a female vine must be 4-5 years old before it can produce fruit. A study done by Penn State and Cornell University determined that more pollination occurs from wind than from traditional methods (such as bees), and therefore male vines are placed on prevailing wind sides. 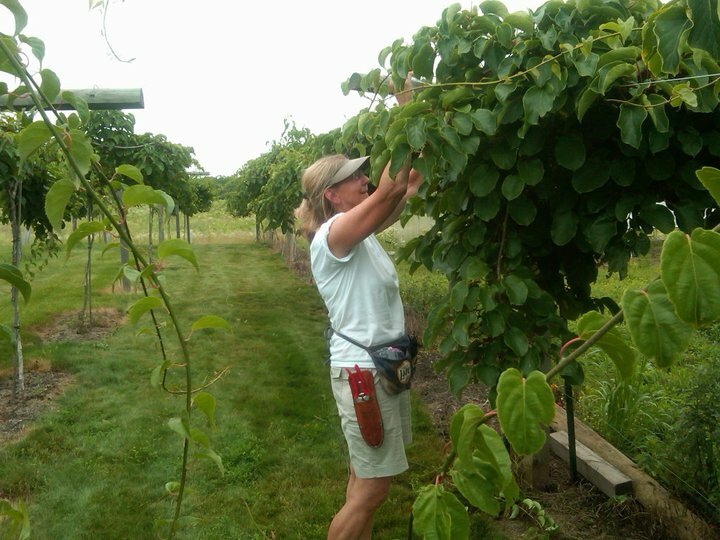 Around the beginning of September, Kathy will start checking the sugar levels of the berries to determine when the proper harvest time will occur. Much like avocados, kiwi berries are better picked when they’re almost ripe. They are picked, placed in cold storage, and taken out the Tuesday before a market. This way, they are at optimum ripeness for the weekend markets. 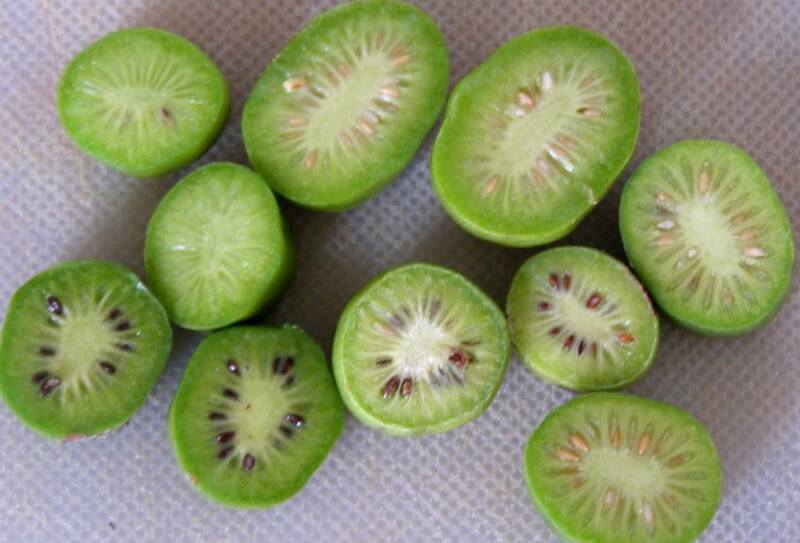 This is something that Kathy stresses to her customers – kiwi berries hold very well in cold storage up to 4 weeks! Little did I know, there are many different varieties of kiwi berries, and they all have their own distinct attributes and flavors. 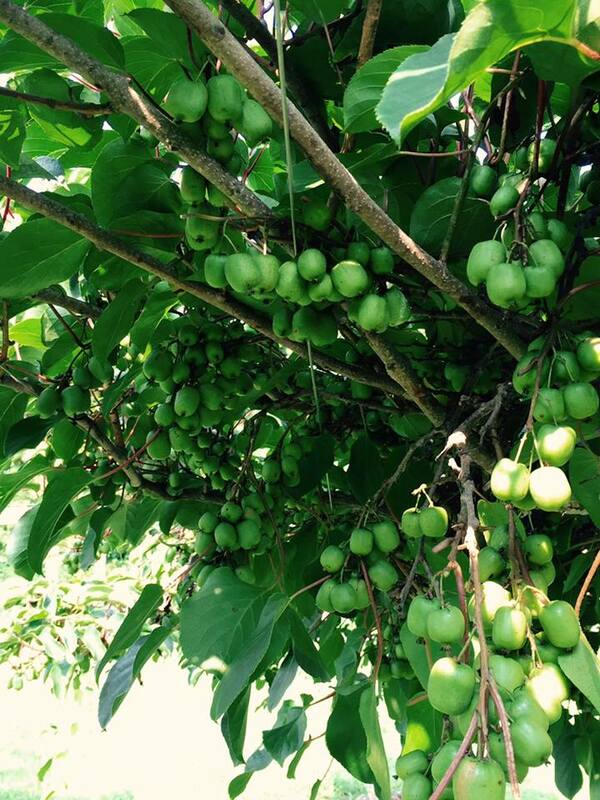 The most popular is the Passion Popper, which will be the first crop of kiwi berries at the markets. According to Kathy, they have a kiwi-strawberry flavor that customers go crazy for. Then there is the Anna variety, which is a little more susceptible to bugs, so the harvest is usually smaller than other kinds. The Anna has a kiwi-pear flavor. Other varieties include the Red Princess (strong kiwi taste and a red interior), the Dumbarton Oak (strong lime flavor), and the Michigan, which has a slightly less acidic, mild kiwi flavor. Kathy is very passionate about educating her customers and is determined to help customers distinguish between the varieties of kiwi berries. 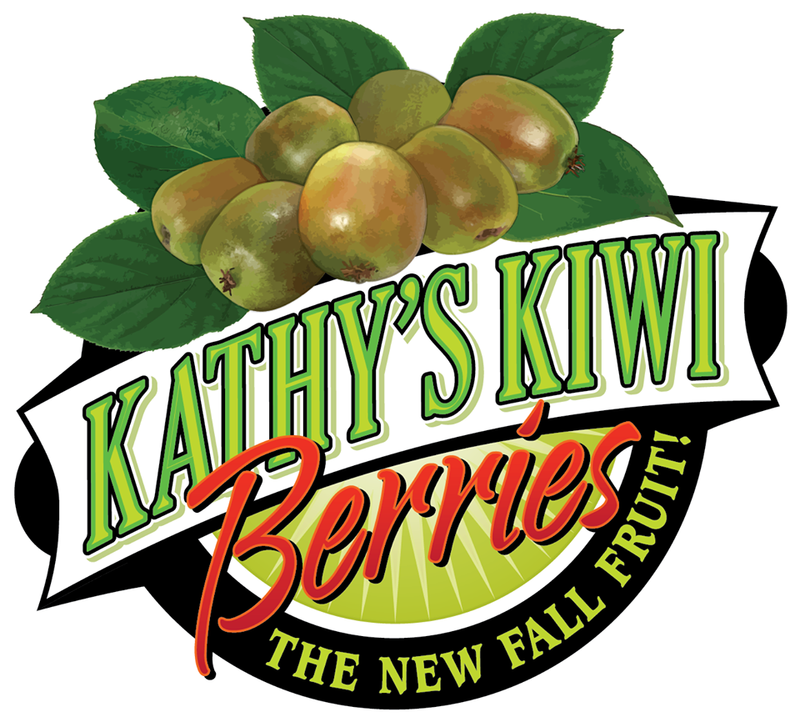 Kathy’s Kiwi Berries will be coming to Bethesda Central Farm Market on the weekend of September 13. I strongly encourage you to put that date on your calendar, plan to be there and taste these amazing fruits. Come talk to Kathy and let her tell you all about kiwi berries – her passion for this product is palpable. I guarantee you’ll learn so much about these hardy treats, just like I did. My post last week about Summer Salads got such a great response from readers that I decided to capitalize on it and continue with the salad theme. This week’s salads are so simple and delicious, they will definitely become regular dishes in my house and hopefully yours too. The first salad is a take on a Mediterranean Salad. 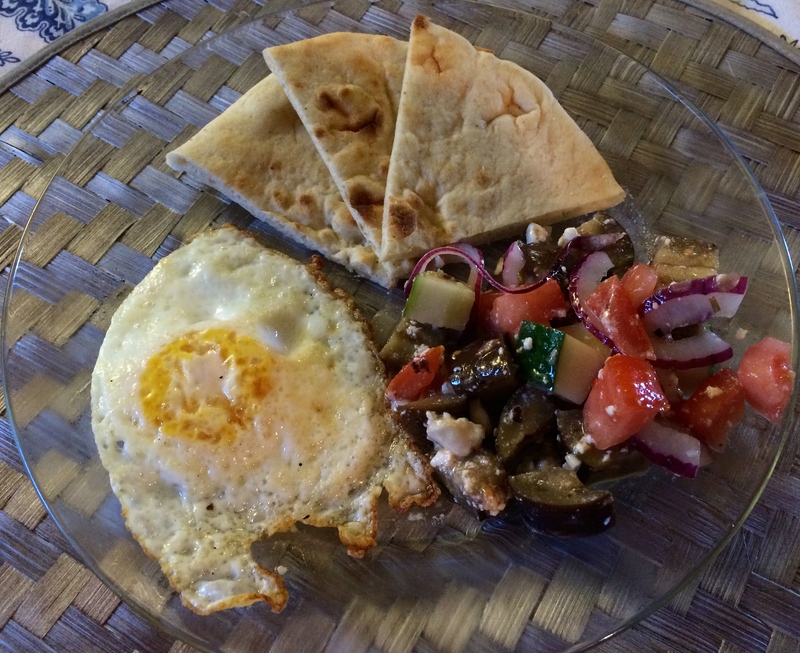 I used the traditional Israeli Salad as inspiration and added my own little farm market twist. 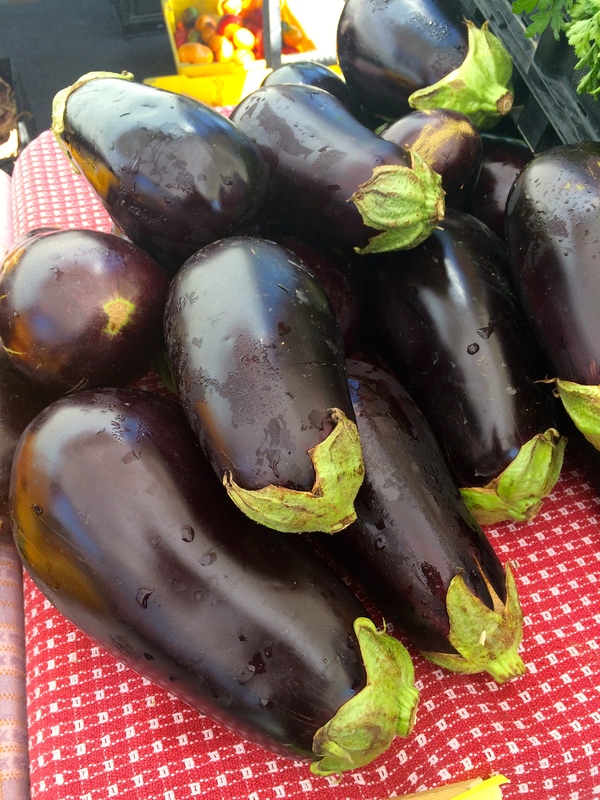 All kinds of eggplants are popping up at the markets, and I love the taste of a grilled one. It has a smoky flavor that brings real depth to the other ingredients in this dish. 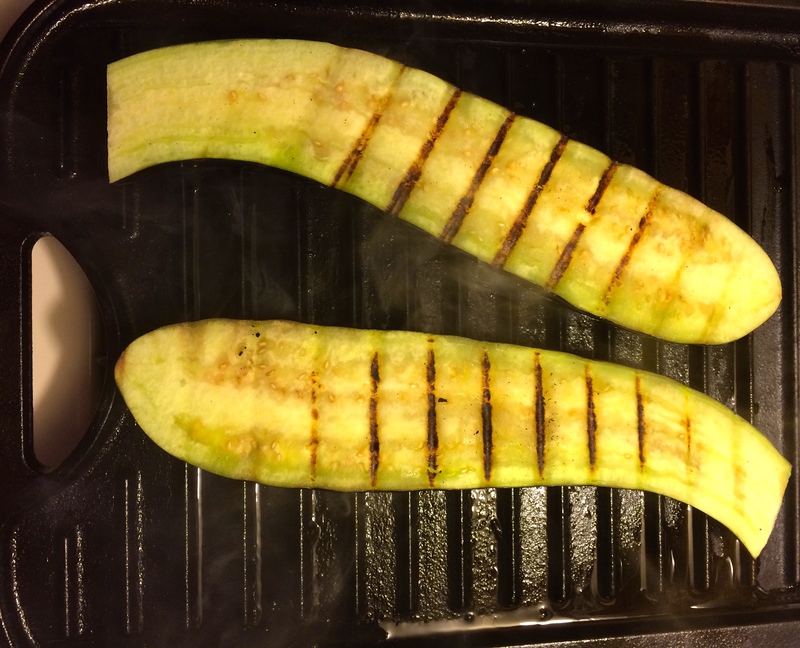 It is important to get a good char on the eggplant and if you don’t have a grill, don’t despair – I was able to achieve it using my stove-top grill plate! (On a gas stove just skewer the eggplant and turn it slowly over the flame). For this salad I wanted to make a dressing that would elevate all of the ingredients but not overpower the dish. Nicole from Two Acre Farm suggested that I use her Triple Basil Salad Dressing. Its made with – you guessed it – three different kinds of basil and it has so much fresh flavor…its almost as if she made it last week in her cute little kitchen! (She did). Add 5 Tbsp Triple Basil Dressing to the onions- this will lighten the intense flavor of raw onions. Let sit while you cook the eggplant. Slice the eggplant in half lengthwise. Cover in olive oil, salt and pepper. Grill for 5-7 minutes on each side. Set aside to cool, preferably transferring to the refrigerator when room temperature. Combine tomatoes, cucumber, and the onion/dressing mixture into a large bowl. Cut the feta in half and crumble one half into bowl. Add chilled eggplants. Toss to combine. Season with salt and pepper to taste. Serve chilled! 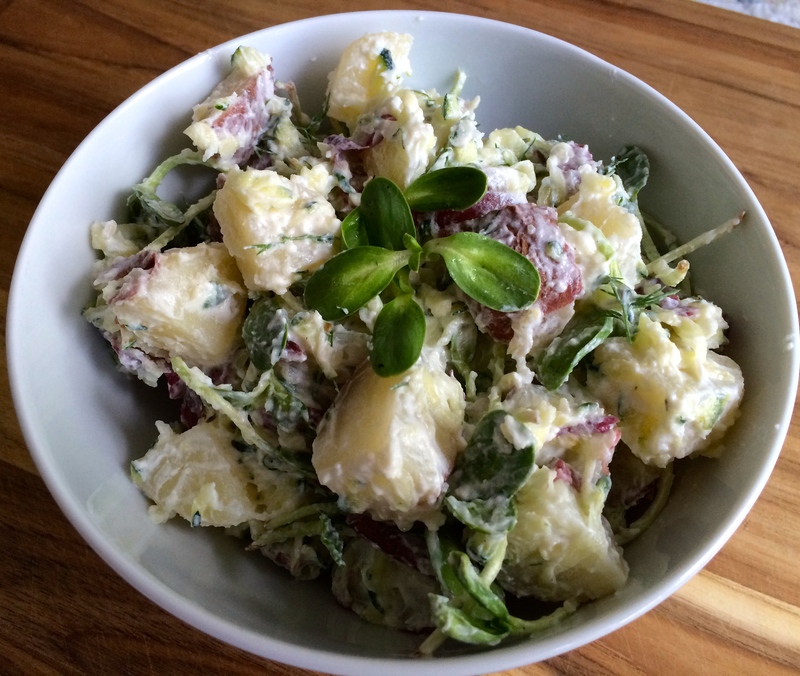 The second salad has two interesting farm market components – zucchini and sunflower sprouts. The method for cooking the zucchini is one that is used frequently when making zucchini fritters (which I love) or with cucumbers for tzatziki. Salting grated zucchini allows all of the moisture to escape, which means the finished salad will have less liquid. The second summer-themed farm market ingredient that added some pizzazz to this salad, the sunflower sprout, is one of my favorite things grown by Rob from Young Harvests. They have a delicious crunch that works perfectly with the texture of the yogurt and zucchini. I actually like to just sit on the couch, put on a movie, and snack on them! They’re a healthy treat for kids too. Add potatoes to a pot of salted water. Cook until you can easily stick a fork into the largest potato. When done, drain into a colander and let cool. Meanwhile, coarsely grate the zucchini into a colander. Sprinkle salt over the zucchini- this will remove the excess moisture, which will drip out the bottom. Wait 10-15 minutes, squeeze the zucchini to drain more, then rinse. Get as much water out as possible. Once potatoes are cool, cut into cubes. 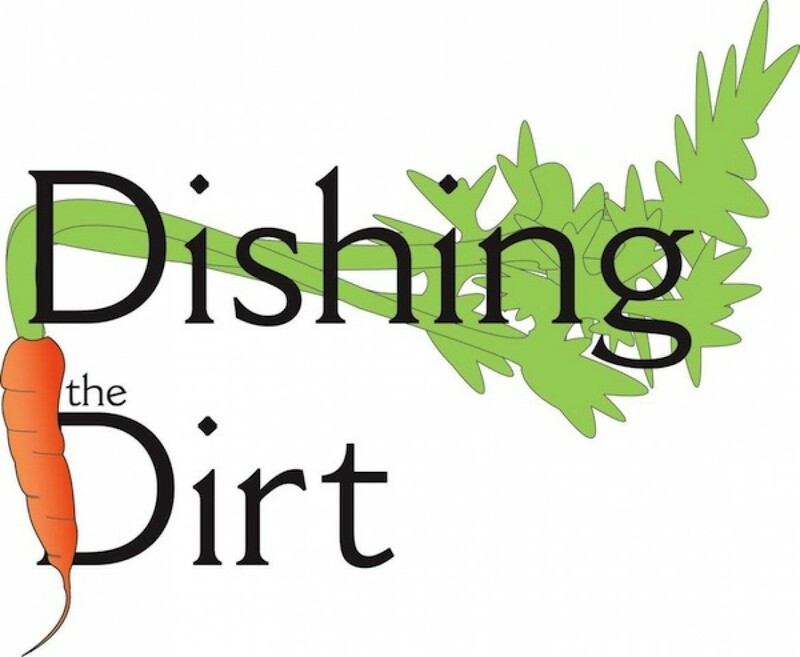 Remove the dill from the stems and combine all remaining ingredients. Season with salt and pepper to taste. Serve chilled! Both of these salads can be modified to utilize seasonal ingredients available throughout the year at the farm markets!